$10 per team of two (one adult and one child). Join us for this fun kids’ workshop at River Arts! This class is meant for kids ages 5-8 to take along with a parent or guardian. Join your little one in a fun Easter egg craft project! 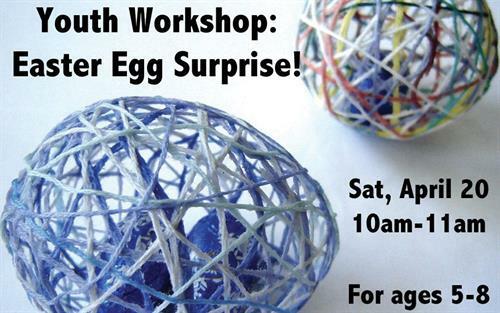 Your instructor will guide you through this simple but fun process and you’ll take home 2-3 yarn eggs, each with a special surprise inside! All supplies included. *Aprons provided but be prepared to roll up your sleeves and enjoy the gluey mess! Each team should be one child + one adult. For multiple children, please have another parent or adult come along.